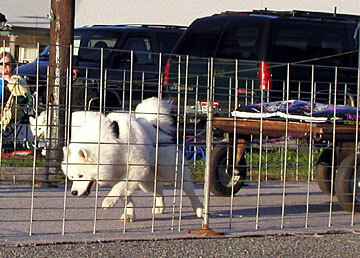 The 2002 Samoyed Club of America National Specialty took place in Carlisle, Pennsylvania. Lots of fun working events were offered, alongside the conformation show. Lightning and Nimbus hiked with nearly 20 other Samoyeds (including their brothers Loki and Draco) on the Appalachian Trail. 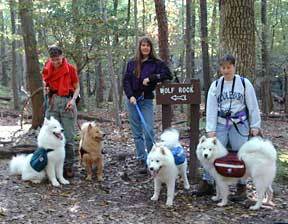 Our boys, seen on the right, hiked in their royal blue Wolf Packs Reflector dog packs. Their brothers are next to them wearing their purple Banzai dog packs. The picture above shows Lightning pulling 14 times his body weight in the SCA Novice Weight Pull. He worked his heart out for me, and pulled the second highest weight that day, 757 pounds! He made 12 pulls in all, increasing by 50 pounds each time. All of his pulls were under 6 seconds, with the exception of his last which was under 7 seconds. Several people commented that Lightning really lives up to his name! Nimbus had fun at the Novice Weight Pull event too, hauling a total of 402 pounds. He had never done this before, and seemed to get a kick out of the applause and attention. We look forward to entering more weight pull events with him in the future! 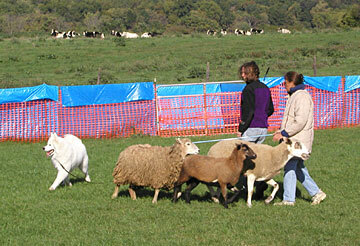 Nimbus participated many other activities at the National including sheep herding. This picture shows his introduction to sheep. He was very enthusiastic, and it was fun to watch him interact with them. Lightning also worked sheep, and completed his Junior Herding Dog (JHD) title at this event. He did a lovely job of moving three sheep around a field the size of a football field, and through several gates, in a controlled manner. 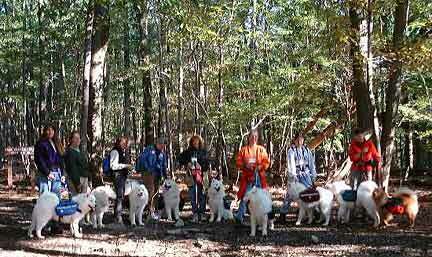 We drove from Oregon to Pennsylvania to attend the 2002 Samoyed Club of America National Specialty. Round trip was almost 9,000 miles! During our adventure, we visited some of the most beautiful spots in America. 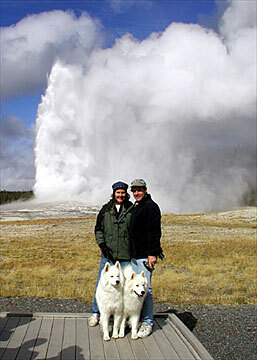 One of our favorites was Yellowstone National Park. Here is Lightning surveying a herd of bison. Both of our dogs were fascinated by the gigantic animals. One of the world's most famous geysers, Old Faithful, did not disappoint us! We got to watch it erupt twice during our visit. Nimbus is pictured on the left, Lightning on the right. 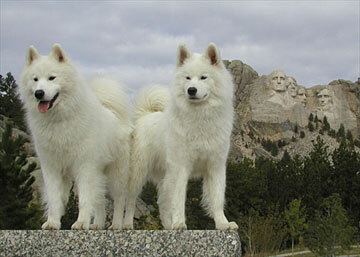 Later, Lightning (left) and Nimbus (right) visited Mount Rushmore. We thought their likenesses would make a great addition to the monument alongside presidents Washington, Jefferson, Roosevelt, and Lincoln. After the National, we visited Matt and Cynthia Woodard who own Loki (litter-brother of Lightning) and Draco (litter-brother of Nimbus). We scootered with the four boys on some lovely Massachusetts trails. The trees were cloaked in autumn colors. One great run took place on Cape Cod. Pictured from left to right: Nimbus, Lightning, Draco, and Loki. Notice how the two teams are in-step with each other. This is something we often notice in an efficient sled dog team. 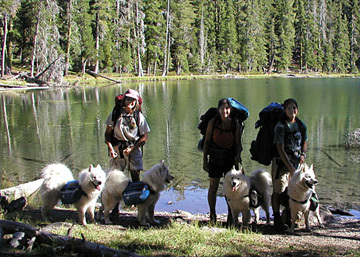 In the summer of 2002 we went on a great backpack trip into Mountain Lakes Wilderness in Oregon. We really enjoyed the rugged trail system into this ancient caldera. This region shares the geologic history of Carter Lake, but instead of forming a bowl, glaciers cut away several sides of this crater and left behind many small lakes. 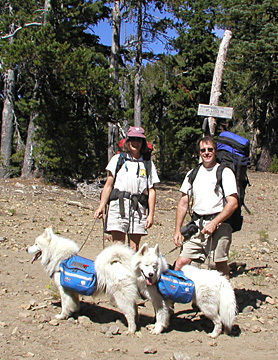 Lightning (on the left) and Nimbus (on the right) carried 25% of their body weight in their Wolf Packs Reflector dog packs. Nimbus' load included one of his favorite stuffed toys, and both of the boys carried water, their food, treats, dog boots, first aid items, and other necessities. Once we hiked down the steep sides of the caldera, our route went past many beautiful lakes. This is Como Lake, which was very clear and peaceful. Pictured on the left are Linda with Lightning & Nimbus. In the middle is our friend Candice with Corby. On the right is Francisca with Reign. 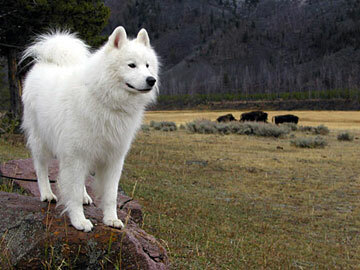 All of these beautiful dogs are related pure-bred Samoyeds. 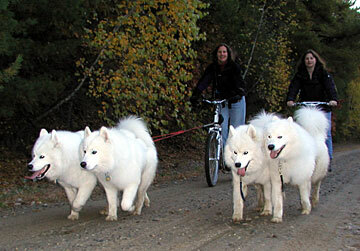 Nimbus, Corby, and Reign earned points toward their Working Samoyed titles on this 14 mile trip. Lightning has already earned his Master Working Samoyed title, which is the most advanced working title offered by the Samoyed Club of America. At 15 months old, Lightning began to do serious backpacking. 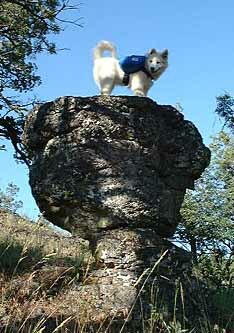 We are shown here resting atop Hobart Bluff in the Cascade-Siskiyou National Monument. Tranquil Hobart Lake is 680 feet below us. The town of Ashland, city of Medford, and the Rogue Valley spread out beyond into the distance. Here Linda and Lightning take a break on a fallen tree along the Pacific Crest Trail in southern Oregon. 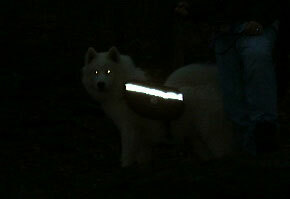 His loaded Reflector dog pack weighs over 12 pounds, which is ¼ of his bodyweight. We hiked five miles on this outing, following a nearly seven-mile hike on the previous day (which was National Trails Day, June 2nd, 2001). 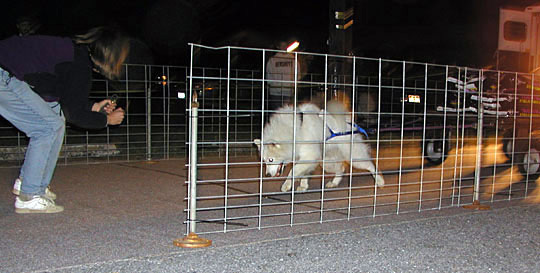 Since the Samoyed is a working breed, various traditional working events were offered during the Samoyed Club of America 2000 National Specialty. We hiked with a group of friendly people and dogs on a five mile loop trail through beautiful Catoctin Mountain Park in Maryland, which is very close to Camp David. All dogs carried a pack, most of which held gear weighing at least 25% of the dog's body weight. Our Lightning (far left with blue pack) and his brother Loki (third from the right with burgundy pack) carried lightweight wadded newspaper because these puppies were only seven months old. Here is our adventurous trail puppy about to embark on the hike. As you can see, we began the hike at an unthinkably early hour. Even though he's snowy white, the reflective trim on his Reflector dog pack and his eyeballs are all that the camera flash could record. Here we stand at the trail sign for Wolf Rock. We just had to pose the dogs by the sign because our company is named Wolf Packs. Dogs from left to right: Kyber and Red (our token non-Samoyed) both owned by Diana Steele, our Lightning, and Loki owned by Cynthia & Matt Woodard. 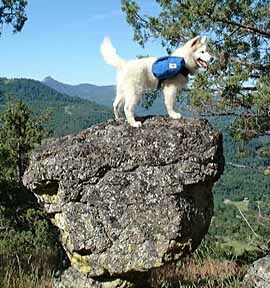 Here is our adventurous puppy Lightning standing on top of an amazing balanced rock that sits near our home. I had often thought how wonderful it would be to photograph one of our dogs at the top. Lightning is wearing a royal blue Trekker dog pack (now replaced by the Reflector). Because he's so young, his dog pack is empty and just for fun. Puppies should never carry weight until they are fully grown! I worked with my little buddy for a week with my "Rock" command, using tree stumps and low rocks to practice on. Basic click & treat rewards were part of our program, whenever all four of his feet stood on the object I pointed to. He was very comfortable standing atop this geologically doomed formation for these photographs. Lightning is captured here during his very first dog pack experience. 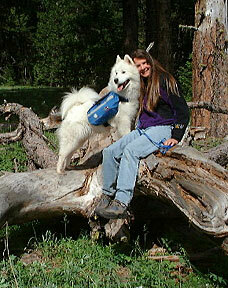 He is a fine example of the ancient Samoyed breed, and will eventually grow to be a strong, handsome 55 pound dog. Lightning adores people, and has an outgoing, happy attitude toward life. He is a joyful member of our family. 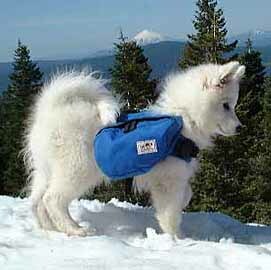 Our 13 week old puppy is pictured in a royal blue Trekker (now replaced by the Reflector) dog pack. 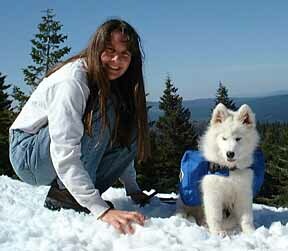 These dog packs are made by our dog outfitting company Wolf Packs, for which our dogs model. Although we couldn't resist letting Lightning try on an empty dog pack for these pictures, puppies should never carry weight until they are fully grown. 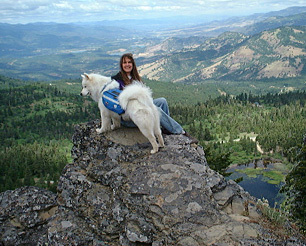 Linda and Lightning are enjoying the sunshine on the summit of Soda Mountain in the Siskiyou Range of southern Oregon. This special region is now part of the Cascade-Siskiyou National Monument, and has been deemed the most diverse biological area in North America. From our spot it seemed like you could see forever. Mount McLaughlin, an inactive volcano in the Cascade Range to the north, is visible in the distance in the top image.